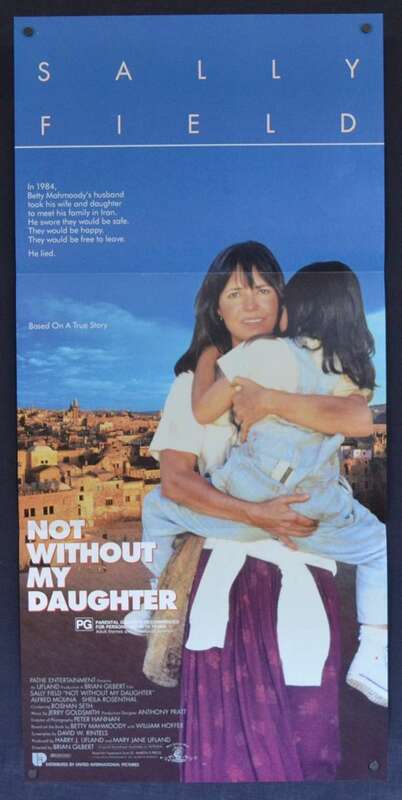 Not Without My Daughter is a 1991 American drama film depicting the escape of American citizen Betty Mahmoody and her daughter from her abusive husband in Iran. The film was shot in the United States, Turkey and Israel, and the main characters Betty Mahmoody and Sayed Bozorg "Moody" Mahmoody are played by Sally Field and Alfred Molina, respectively. Sheila Rosenthal and Roshan Seth star as Mahtob Mahmoody and Houssein the smuggler, respectively. Sheila Rosenthal, won the Young Artist Award for Best Actress. Pin Holes: One at each of the top corners only and one at the bottom border in the centre. Comments: Great image from a compelling story.